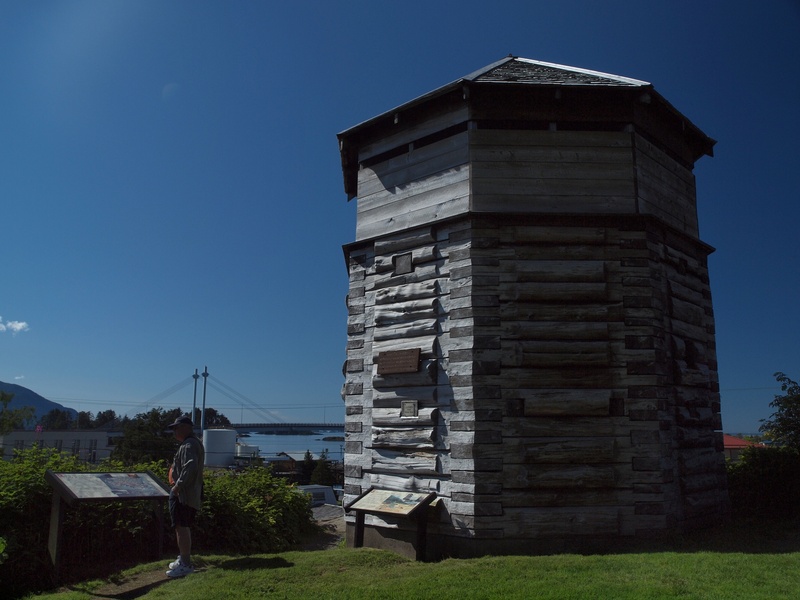 A reconstructed blockhouse like those used by the Russians on a hill above Sitka harbor. We flew from Ketchikan to Sitka on a lovely, clear evening, our good weather miraculously holding for almost a week. Our B&B had a view of the ocean but was a good walk from town so we walked into town every day for meals and to see the sights. Aside from one really drenching morning beachcombing later in the week (we found sand dollars and a purple starfish with 20 legs) we were warned away from all trails and walkways because of the BIG brown bears (inland they are called grizzlies). Apparently, there had been a drought in Sitka which meant the bears had not had enough berries and the streams were so low that the salmon were late spawning. While we were there the rains began and we did see Pink salmon spawning in the creeks. Sitka was the Russian capital of Alaska until the region was sold to the United States in 1867. Russians had explored and settled the coast in search of sea otter and had brought the Russian Orthodox mission to natives with them. The fur trading companies financed the churches as part of an agreement with the Czar. 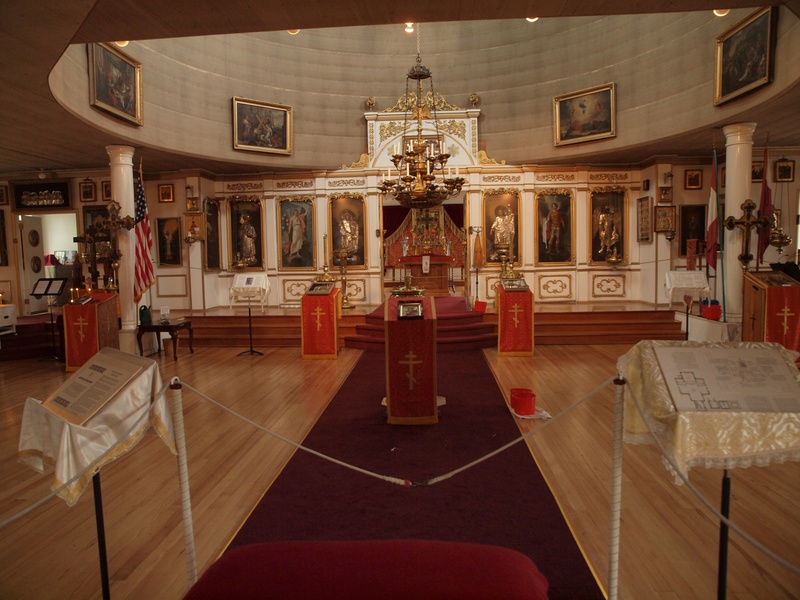 St. Michael's Russian Orthodox Church is the heart of downtown Sitka. The Orthodox missionaries settled among the Aleuts, the Yupik and Inuit (commonly called Eskimos), and eventually the Tlingits of the inland passage (southeast Alaska). They learned the native languages, developed alphabets and translated Bibles. Still, the Tlingits who controlled the high hills that guarded the harbor fought in 1804 against Russian incursion. They were defeated by Russians and neighboring Haida warriors and left the area for 20 years. When they returned the Russians had built their fortifications on those same high places. St. Michael's Russian Orthodox Church is the flagship church for the state. The congregation is nearly all Native. They use many icons, or pictures, of saints. They do not use sculpture. Lavrenty Young went to seminary to become a tonsured reader for St. Michael's, (shown here with his wife Marina who volunteers to keep the church open for tourists). We were interested in the Orthodox approach to mission among natives, which didn’t require them to give up their culture and language to become Christian. We decided to attend worship – “the Divine Liturgy”- on Sunday morning at St. Michael’s Cathedral. 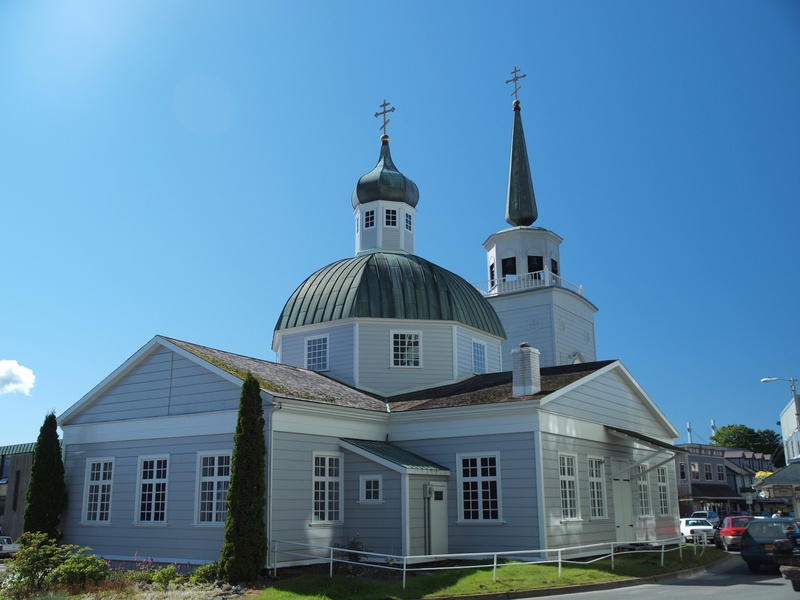 The Cathedral, founded in the 1830s, is located in the center of Sitka. The congregation is almost entirely Tlingit. The historic and visual importance of the Cathedral in the community reminded us of St. Francis Church in Ranchos de Taos. It functions the same way, as a place of worship but also as a favorite tourist destination. Rev. 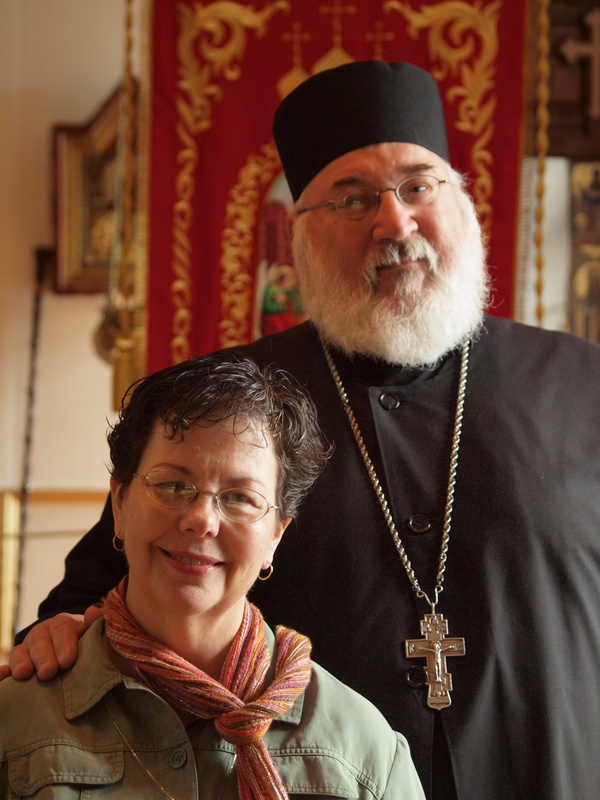 Father Michael Boyle and his wife, Magdalena (the minister's wife is called "Matrushka," which means "little mother"). The Divine Liturgy lasts two hours, most of that standing, and is more elaborate than the standard Catholic Mass with candles, incense, visual images (icons and crosses) and continuous chanting. It is really one long series of prayers that incorporates chanted scripture readings, a sermon (not chanted), and communion. The liturgy has not changed in centuries and is the same all over the world. That Sunday, one of the families was hosting a feast in honor of a deceased loved one, Joe Johnson. What a feast it was. The people were friendly and interested in our journey. 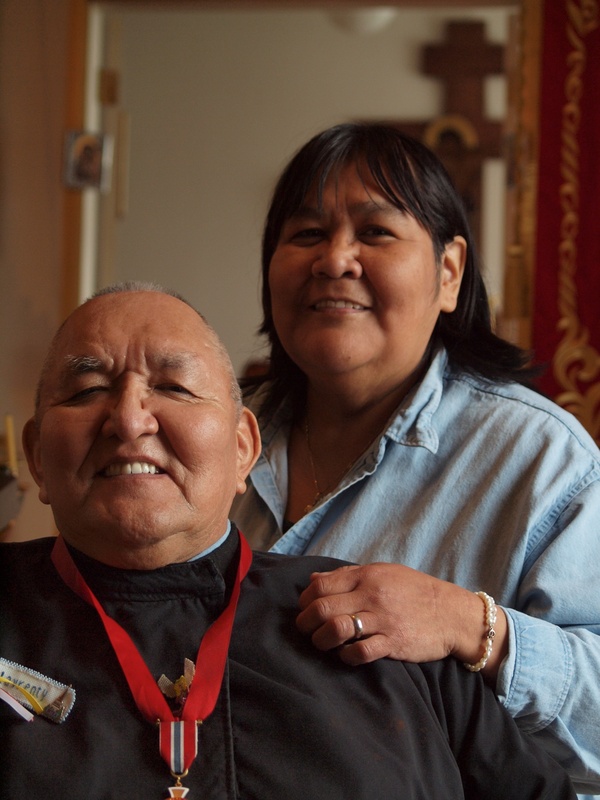 Some of the elders, recognized in Sitka as treasures, gave testimony to the life of their friend which reminded us of the kinds of speeches we would hear in Navajoland on high occasions. One afternoon we took the Tlingit Tribal Tour complete with beautiful dances in the clan house and a visit to the totem park. We had a conversation there with a totem pole carver who explained that every pole tells a story. He uses traditional themes but said that after hearing the story of the pole he comes up with his own original designs. His newest pole in the park included a Russian calendar and a cross, which our guide said meant “Presbyterian.” Historically among the Tlingets, you were either Russian Orthodox or Presbyterian. This new totem pole in Sitka was erected in the old-fashioned way - at low tide, anchored with four boulders and pulled up with ropes by the whole community. It shows a Russian calendar, a cross for the Presbyterian missions, and Mother Earth on the bottom. Our last day in Sitka, we met the newly-arrived Presbyterian pastor, Diane Wonnenburg and her minister husband, Charles. They had come from South Dakota where they were working among the Lakota people. They were just getting their feet wet, literally, in their new ministry but graciously took time out to swap stories with us over coffee. The Sheldon Jackson School and College, founded in 1878 by the Presbyterian Church, provided an education for Native Alaskans for over a century. We then headed over to the former campus of Sheldon Jackson College, a monument to the pioneering efforts of Presbyterians to Native Alaskans. Jackson was the pre-eminent leader of Protestant missionary enterprise among Native peoples throughout the West, but he found his special love in Alaska. It was a bittersweet experience seeing the empty dorms, offices and classrooms of the school which closed just four years ago. The good news is that the campus has been sold to Sitka Fine Arts Camp which will host hundreds of children of all ages in the restored buildings. Jackson made countless trips throughout Alaska via ocean ships, canoes, dog sleds and other means of transport to oversee his mission field, as well as hobnobbing with high government officials in Washington and speaking tirelessly to church groups to raise funds (during these same years the Taos and Ranchos churches were founded). It is said that he logged over a million miles in his lifetime. 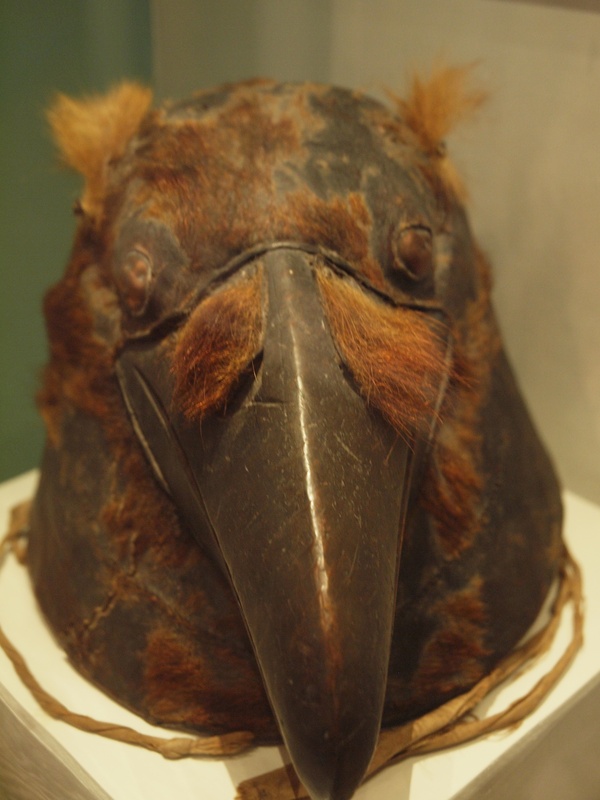 Raven Ceremonial Hat. 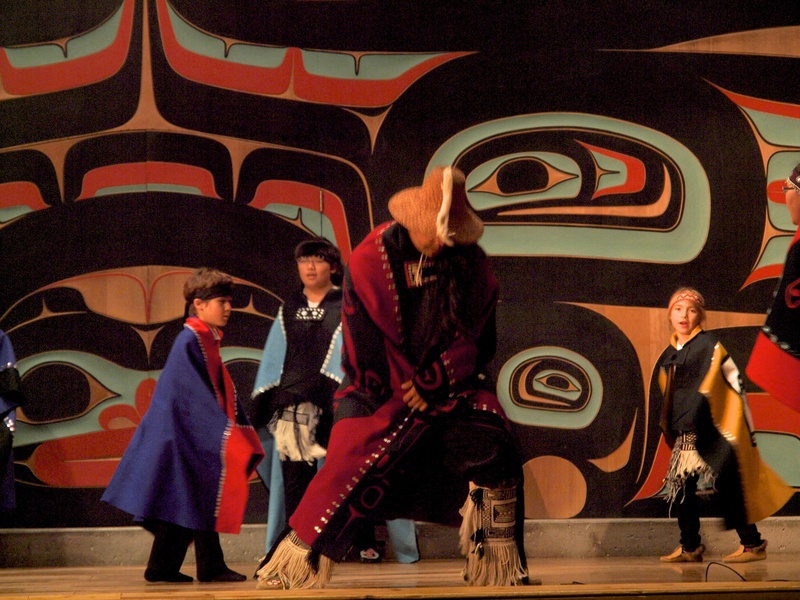 All the people of the coastal tribes of Alaska are either of the Raven or Eagle moiety. The two moieties (from the French for half) are ancestral kinship groups which are broken down into clans. People must marry into the opposite moiety, so every child will have a parent from each moiety. That evening we flew off to Juneau where the rain was getting serious.